The YSL affiliate drops off a new tape featuring Young Thug, Lil Durk, and more. 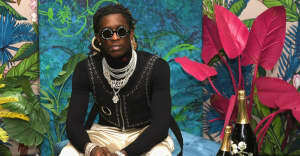 Lil Duke, or simply Duke as he is known on Young Thug's "For My People", has been affiliated with both Young Thug's YSL camp and Peewee Longway's MPA crew. As both artists' fame continues to grow, Duke seems like the next logical artist from the two familial crews to blow. Yesterday, Duke dropped off Uber, a 14-track tape that features guest contributions from Young Thug, Lil Durk, and Lil Yachty, as well as production from Thugger mainstays Wheezy, Goose, and London On Da Track. Obviously, the beats are a strong point, but Duke's style is also effective. Though his flow is clearly influenced by Young Thug, he manages to use the melodic elements without sounding too derivative. The tape also features Thug's sisters, Dora and Dolly, who made their rap debut on his I'm Up tape. Duke will be joining Young Thug on his Hy!£UN35 Tour, which kicked off last night in Philadelphia. Listen to Lil Duke's Uber mixtape below via Datpiff.